The makers of Sangamithra are still in search for a leading in the film which was supposed to be played by Shruti Haasan initially. After Shruti Haasan opted out of Sangamithra, the makers have been in search of a leading lady for the film which seems to be consuming a lot of time. The first look posters of the characters in the film were revealed at the prominent Cannes Film Festival this year by the cast and crew of the film. Starring Jayam Ravi and Arya in lead roles, Sangamithra had Shruti Haasan was supposed to play the titular role in the film but opted out of the film because of not receiving a bound script. Post all the saga, the makers of Sangamithra have now approached all the top actors in South Indian cinema for the warrior princess role. Hansika Motwani and Nayanthara were the top contenders for this role acoording to speculations in the industry circles. 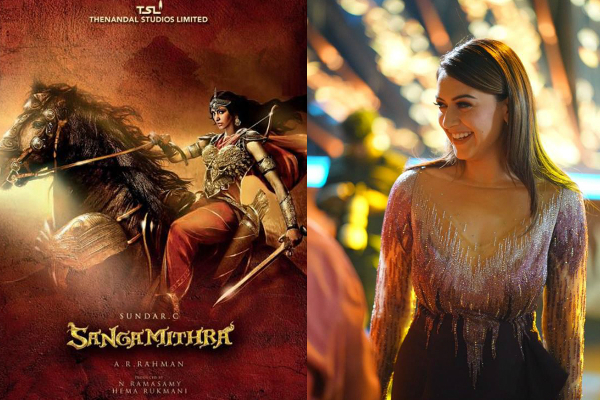 Latest buzz in the industry is that Hansika Motwani has been signed for Sangamithra, which will be directed by Sundar C. But a source close to the unit of the film says that Hansika is not yet confirmed for the lead role. “Hansika has been approached, yes, but she hasn’t been signed yet as opposed to some reports. In fact, the makers are in talks with a few more actresses and it’s not sure who they plan on signing,” a source from the film’s unit told a news agency. When Shruti Haasan opted out of the film, speculations were high that Nayanthara would be the top contender for the role in Sangamithra. But with so much competition, this seems to be a tough fight for the lead role in Sangamithra. Lol are they serious? Hansika?!! She is a terrible actress and can barely get her lip sync right. Shruti is a bad actress too, but atleast she knows Tamil. This role requires someone like Nayan or Anushka.